" Porous cells from the parenchyma of the stem of Arundo Donax, u Porous cells, from the petiole of Hoya carnosa. ** Porous cells of the petiole of Cyca* rcvoluta. Small pores are found where the cells are united to each other, but large ones where the cells open into the intercellular passages. 14 Porous cells from the wood of Abie$ exceUa. The pores are surrounded by a large external circle. Schubertia disticha, seen from the surface and in transverse section. The dotted lines explain the relation which the two aspects bear to each other. m Semidiagrammatic. Transverse sections of the pores, a, Pores small, in relation to the spot where the neighbouring cell-walls separate from each other, 6, Pores large, in relation to this spot. c9 The separation of the cell-walls so small that it only appears as a black streak. 4 The separations not observable between the cells are apparently homogeneous layer rings, in which the pores terminate. m Porous cells from the perispeum of the ivory nut. * Transverse section of an intercellular passage, with the three portions of cell-wall which forms it The larger pores in the deposit-layer of the intercellular passages» as well as the smaller ones on the double cell-walls, are seen. The corners of the inter« cellular passages are rounded off by a peculiar deposit. is offered as an explanation of the facte, to guide farther inquiry, rather than as a true law of development. There are two cases which eeem to form exceptions to this view. The first is the formation of pores, which open into intercellular passages independent of the neighbouring cells. These are very beautifully seen in the petioles of the Cycas revoluta. In this case the single wall is easily affected, and the intercellular passages, filled with air, act in the same way as the air-clefts. We frequently see, also, a great air-cleft, forming a large fissure-like pore on one side, and many little pores on the other side, as is frequently seen present in the porous vessels of the BaUaminert. In a similar nmuncr the porous cells of the medullary rays in various species of Pinus often exhibit a longitudinal air-cleft, which resembles the pores in many cells. I ______J e when the cell-walls do not extend, and the spires touch each other, but do not grow together. This is the form on which Mcyen founded his false theory of the fibrilliforra nature of all cell-membrane. This phenomenon often presents itself, as in tbe cells of the parenchyma of the tubers of the Dahlia (Plate L fig, 26,), the hairs of the young leaves of Cycas re-valuta^ in the hairs of many MammiUaritE and Mclocactctf, the scales of tbe buds of Pinus sj/he&tris, &c. Sometimes the spires in these cases present fissures, as is beautifully seen in the cells of the rootlets of Oncidium altissimum (Plate I-fig, 24.).
" a. Annular duct« from the stem of Ctinna otchftntnlis* with a regular distance of the ring*. ¿t Annular ducts from the petiole of Muta »apientuin, the vessel between the two rings being distended, e, d, Spiral from a cactus, very young, and perfectly developed. et A spiral vessel from CucurhiUi with some of the spiral fibres ruding lt> a point takes place in the old stems of Scitamineœ, and of speces of CommeKneœ, as in Hedychium Gardnerianum, and Tradescantia crassula. Another regular formation of anastomosing fibres occurs between the spires of neighbouring cells. This may be seen in the large knotted vessels of many Balsamineœ. In these may be seen a perfectly regular spiral fibre with a slight yellow colouring, but accompanied by another short, almost colourless, vertical branch, which is easily recognised by its transparency. If this is traced it will be found to follow accurately the course of the commissure between the two vessels, and to form a kind of bridge over the commissure from one fibre to another. This clearly does not belong to the original spiral formation. Its constant appearance in porous vessels, with long transverse clefts, has caused it to be called scalariform tissue. In the last place the annular ducts present some striking phenomena, amongst which must be reckoned the constancy of the distance between the same annuli. A remarkable instance of this I have observed in Canna occidentalism where a short distance between the annuli regularly alternates with one three times as long (fig. 31. a.). In the annular ducts of the petioles of Musa paradisiaca, I have observed the cell between the two rings to be remarkably distended and swollen, so that there could be no union with the rings of cells near to each other. Historical and Critical Remarks.—The spiral fibres were early discovered by Malpighi and Grew, or perhaps even sooner by Henshaw. Bernhardi (Ueber Pflanzengefässe und eine neue Art desselben : Erfurt, 1805) and Moldenhauer (Beiträge zur Pflanzenanatomie: Kiel, 1822) pointed out the existence of the external cell-membrane enveloping the spiral fibre. The annuli or rings were discovered by Bahel, and their enveloping membrane by Bernhardi. (See Link, Elementa Philosophixe Botanic®, ed. sec. torn. i. p. 27. 169.) The porous cells were discovered by Leuwenhoek (Opera omnia, tab. 462. fig. 20. ); but they were first correctly estimated by Mirbel (Histoire Nat. des Plantes, 1800, torn. i. p. 57. ; Traité d'Anatomie et de Physiol, végét., Paris, 1802, t. i. p. 57. fig. 1—4.). He was at first opposed till Hugo Mohl published his observations confirming Mirbel's views (Ueber den Bau der Ranken und Schlingpflanzen, Tüb. 1828). Mohl also discovered the membrane investing the porous cells (Ueber die Poren des Pflanzenzellgewebes, Tüb. 1828). These are the most important steps in the history of our knowledge. What remains is the notice of the more or less frequent occurrence of one or another modification. Meyen (Physiologie, vol. i.) has collected a large mass of information on the whole of this subject. Valentin (Re-pertorium, vol. i.) was the first to contend that all these formations originate in the spiral. Link (Elementa) maintains that the pores and clefts are portions of torn spiral fibres. Mohl is of opinion that the annular ducts are primary formations. Hartig (Beiträge zur Entwicklungsgeschichte der Pflanzen, &c. Berlin, 1848) has announced a view of spiral cell development which cannot be regarded as any thing more than an ingenious fiction, it having no foundation in facts. here belong the so-called porous vessels of the wood); or in one part of the cell it becomes changed to rings, whilst in another part it becomes spiral, netted, or, what more frequently happens, it remains entirely porous. To this point too little attention has been given. We know in this relation only the last modification, the mixed tubes (tubes mixtes) of Mirbel. Here, however, belong also the so-called porous vessels of our dicotyledonous woods, which, in the manner in which they are spoken of in books as tubes formed of an entirely porous membrane, certainly do not exist. All these so-called vessels are only so far porous as they touch one another; as, where they project on the wood-cells, these walls are often almost entirely homogeneous, and exhibit scarcely a trace of pores. This may be easily seen if the individual cells are isolated by means of nitric acid. When these vessels are arranged in radial rows, but never or very seldom when they lie laterally on one another, if we cut them directly across we shall find very evident porous walls, but never or extremely seldom are they to be seen by a longitudinal section. This is the case in the Conifera, where the pores predominate (but not exclusively) on the side next the medullary rays; or in the Hibbertia volubilis, where they appear, on the contrary, towards the pith and the bark, seldom towards the side of the medullary rays; so that the two other sides in these cases have a homogeneous development. § 20. The process of depositing layers is often repeated during the life of a cell, a. Each successive layer is generally deposited accurately upon the preceding, ring upon ring, spiral upon spiral, porous layer upon porous layer, b. But in some less frequent cases the deposit takes place according to the circumstance of the cell; so that when, through extension, the cell-fibres become separated, the extension causes the deposit of a porous layer. Ordinarily, also, the direction of the spiral in the following layer is the same as in the foregoing, but in some cases the direction of the next spiral is directly opposite that of the first. The first condition mentioned above is very common, and rings are often found so very much thickened that they have only a little hole in the centre; and as they do not increase so much in breadth, they appear, when perfectly formed, like thin discs with a hole bored through them. They are seen in the Cactece, as Opun-tia cylindrical Melocactusf Mammillaria, &c. This occurrence is also very frequent in porous cells, so that the cavity of the cell is reduced to a scarcely visible point. Such cells. are very common in plants, and a single layer may be easily seen upon a transverse section. The pores of the deposit layers become gradually converted into canals (fig. 32.). Such canals frequently approach each other, and at last unite, so that the inner layer is much less porous than the outer (fig. 33.). With these may be compared the elegant formations in the so-called m Transverse section of three liber-cells and some parenchyma-cells in the China rtgia (Cinchona $cr6bictdata Humb.> The liber-cells show very clearly the deposit layers and the porous canals. bium spiral cells with the fibres close together; in the course of growth these extend, the spires separate from one another, and pores are formed between them, so that here the porous layer is the last formed. How it is formed in other cases is yet a question. In the tender spiral cells of the bark of the Asclepiadea and Apocynacete> and in the delicate spiral cellular tissue generally, there is sometimes observed the appearance of a crossing of the spiral fibres. This may arise from the spires of neighbouring cells, or from the transparency of the walls of the same cell; but there can be no doubt that in some cases it is an original formation (Plate I., fig. 23. ), and arises probably from spires formed in opposite directions. 21. In many cells the spots remaining free from the secondary deposits become fluid and are resorbed. In this way cavities are formed in the membrane. Upon this depends the distinction between cells and vessels. The last are only rows of cells whose cavities have in this way been brought into union with each other. In his work on the structure of the palm-stem, and in other places. n Porous cells of the petiole of Cyca* revduta. Small pores are found where the cells are united to each other, but large ones where the cells open into the intercellular passages. * Vessels from IleOeborui faUidus. A% Longitudinal section, a, Two adhering vessels with the pores cut through, and the projections of the spiral fibres. 6, The wall of the vessel, without pores touching the wood-cells, with the projections of the fibres. Bf A vessel seen from without. Hugo Mohl was the first to point out the distinction between these excavations and pores ; and daily observation confirms the existence of actual cavities in the membrane. The existence of a free communication between the vascular cells was early recognised ; but they were regarded as originally continuous tubes, and wonderful views of their structure announced, because the history of their development was not studied. All vessels consist originally of vertical rows of closed cells, in which are gradually deposited the secondary layers, according to the forms of which they are named. When these deposit-layers are tolerably perfectly formed, a process commences whereby the primary cell membrane is resorbed, so that the individual cells are brought into free communication. This resorption generally includes all horizontal formations of the deposit process, but in some cases a horizontal wall remains with only a pore or hole in its centre (fig. 35.). Such formations present themselves very decidedly in the Mosses in the group Leucophaneœ, as in Sphagnum, in the parenchyma-cells of old Cycadeœ, in the so-called vessels and sometimes porous cells of Coniferce, where they touch the medullary rays, in the green-walled cells of the root-caps of Aerides odoratum, &c.
OF CELLS' IS COMBINATION, AND INTERCELLULAR FORMATIONS. 1. Spherical or elliptical Parenchyma, in which the cells are round This prevails in succulent plants (fig. 36.). * Porous vessel from Anmdo Donax, in which a portion of the outer wall is removed, exposing the point of union of two cells, where a horizontal wall, with a large hole in it, is seen. m Imperfect elliptical parenchyma from the leaf of Acrostichum akicome. The adhering surfaces are porous. 2. Longitudinal, cylindrical, or prismatic parenchyma. It occurs in rapidly growing plants, sometimes in the pith of monocotyledons and in tho interior of species of Fucacece (fig. 40.). .'I. Tabular parenchyma, consisting of four-cornered tabular cells. They occur in the external bark, especially in the suberous and cellular layers (fig. 41.). * 'l'raiuvttrw Motion of the parenchyma of the stem of BaUamina kortauis. " (.onuiluiHiial action of the same. 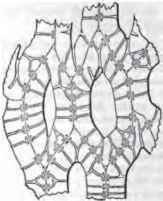 Spongiform Parenchyma, which consists of cells extending themselves irregularly in a stellate form, and which touch only at the end of each ray (fig. 37.). Such tissue frequently fills up the air-passages, and occurs in all tissue which dries rapidly, and also in tho undor luilf of tho parenchyma of most leaven. imnee of any ¡Mirticular dimension. It is found mostly in the pith of plants (figs. 38, 39.). Intercellular passages; small three-cornered canals running around the cells, and seen in almost all kinds of parenchyma. Intercellular spaces; great irregular spaces between the cells, occurring especially in spongiform cellular tissue. 4* Parenchyma from the stem of Vtcia Faba. In the cells are sees porous openings, and In two cells cytoblasts, with granules of starch. 41 Parenchyma from the bark of Querent Sober (cork oak), a, longitudinal section. b, ax seen from surface. ** Tissue from the opening of two dextrin passages in the petiole of Cycat mohtta. The compact parenchyma is clothed with a delicate vesicular tissue, projecting into the cavity. Air Canals. These are formed by a portion of parenchyma becoming changed first into spongiform cellular tissue, which is then torn and resorbed. The walls of these canals are perfectly smooth, and the cavity is divided into definite spaces by a layer of stellate cells, as though interrupted by horizontal layers. Seen in Canna, Nymphcea, &c. (figs. 43, 44, 45.). 3. Air Cavities. In these a portion of parenchyma is inordinately torn by the growth of a portion of the plant. Their walls are rough with the remains of torn cells. Seen in the stems of grasses, many Composite, and in the Umbeïïiferœ. 25. C. Vessels. ( Vasa, Trachea.) When a row of lengthened parenchyma-cells have, through resorption, their cavities brought into continuous communication, such a series of cells are called, by an unfortunate expression, a vessel; and it is distinguished from the above tissues by different names, according to the nature of its walls, as spiral vessel, annular duct, porous vessel, &c. (yasa spiralia, annulata, porosa). • Anatomie und Physiologie der Cacteen.
" Stellate cellular tissue, from the horizontal layers in the air-canals of the petiole of Aponogeton distachyon. The three-cornered intercellular passages are very large, and the rays of the cells proportionately long. 44 The same. The three-cornered intercellular passages are somewhat rounded, and rather small ; the rays of the cell proportionately short. The walls of the cells, between two rays, are somewhat thickened. 44 The same from the leaves of Pilularia globult/era. The cells are somewhat lengthened, with short and broad rays; the parts of the wall in contact thickened ; the intercellular passages irregularly rounded. Frequently, in the later-formed vascular cells, the septum is broken down in such a manner that it remains in a circle as a small edge. This septum is seldom entirely horizontal, but ordinarily somewhat inclined from the axis of the plant towards the radius, very seldom towards the periphery. Such cavities in the septum may be frequently seen by a longitudinal section of a vessel. Treviranus* first remarked this, but knew not what to make of it. Meyen f gave a very unsatisfactory explanation of it. This breaking up of the septum only occurs where there is a kind of resistance on the part of the septum itself. Where this tendency is very strong, instead of a single cavity many are formed, and the septum acquires a regular ladder-like aspect; a fact first announced by Mohl. | Examples may be seen in the Beech, in the roots of Palms, in Arundo Donax, &c. Again, the tendency may be so strong, that the cells may be regarded as lying on one another, and there is formed upon the septum, according to the nature of the celt spiral fibres or pores. That the completely developed vessels contain only air, is a fact that can be ascertained by the naked eye. Sometimes, in old age, abnormal fluids will be found in them, and cells are developed in the vessels. Cells are found in the old porous vessels of the Oak and Elm, and I have found them frequently in the spiral vessels of the stems of Scitaminete, as Canna and Hedychium. Such cells do not appear to me to originate in the vessels, but arise from neighbouring cells being pressed into the vessel between the spiral fibres. The cell thus pressed into the vessel originates the new cells. The so-called moniliform vessels are not formed in a different manner from others. Simultaneous vascular bundles, when all parts of the bundle originate and are developed at the same time, as seen in the Cryptogamia. * Vom inwendigen Bau der Gewächse, Göttingen, 1806, tab. L fig. 10. b. De Palmarum Structure, tab. n. figs. 13, 14,15.
bundles from the thin-walled short parenchyma around. Such are monocotyledonous vascular bundles. Primary vascular Bundles, those which are produced during the first period of vegetation, or first year. In the inner half it consists of the same parts as the closed bundles, only that the vessels are more numerous, and not so regularly arranged; the outer half is composed of cambium-cells, which are distinct laterally and in front, but pass quickly into the surrounding parenchyma. /3. The Wood. 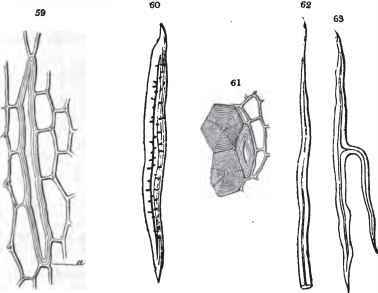 After the completion of the first period of vegetation, the parts of a plant generally cease to increase in length; but as the new cambium-cells must, nevertheless, extend to a certain length, they necessarily interpenetrate amongst each other by pointed extremities. Thus originates, in the place of parenchyma, a peculiar tissue which is called prosenckyma. A part of these retain their narrow lengthened form, pointed above and below (wood-cclls, woody fibres), but between them open individual perpendicular rows of cells, often very strongly marked, which become converted into vessels. The only exceptions to this are the Conifera, Cycadaceee, and some others, where all the wood-cells are tolerably uniform. The portion of wood that is formed first in every year is composed of broad thin-walled cells, and contains more vessels than later-formed wood, which consists of smaller vessels, and the cells are always narrow and thick-walled. In this way the difference between the growth of the earlier and later periods of the year may be dctectcd by the naked eye. It is from this cause that the trunk of a tree displays, on a transverse section, as many concentric rings as the tree is years old; and these are called annual rings. The cellular tissue existing between the vascular bundles and their developing masses, and which ordinarily appear extended from within outwards, are called medullary rays. Such extensions of the cellular tissue are large when they reach from the pith to the bark, and small when they begin or end in the wood. with rings less distant ; then spiral vessels succeed, whose spires, although far apart, are yet not so far apart as the rings of the annular vessels ; then follow closely-wound spiral vessels ; then reticulated ; and lastly, porous vessels. This course is observed although one or more of these formations may be absent. So constant is this structure, that the relative age of two vessels may be easily indicated by it. Thus in monocotyledonous plants we often see porous vessels lying at the side, or behind, the spiral and reticulated vessels, but they arise later than the others, and this is shown by their configuration. * Simultaneous vascular bundles from the stem of Polypodium ramosum. A% Transverse section. 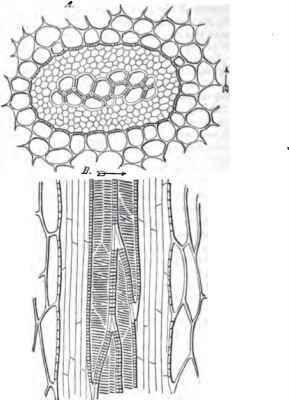 By Longitudinal section, through the smaller diameter of the vascular bundle. The arrows show the direction from the centre to the periphery of the stem. The thickened, somewhat lengthened, parenchyma which lies upon the vessels, surrounds a thickened, very lengthened, parenchyma which represents the cambium in monocotyledons. 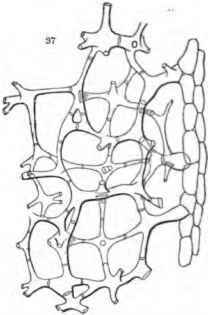 + See Mohl de Palmarum Structure, where there are many drawings of mono-eotyledonous vascular bundles, but which do not express strongly enough the above peculiarity. surrounding parenchyma (fig. 47. )- Still, examples are veiy frequent in which the vascular bundles pass into the surrounding parenchyma. ft. In the earliest stages the vascular bundles of the Dicotyledons cannot be distinguished from those of Monocotyledons. The difference is first visible towards the close of the first period of vegetation. 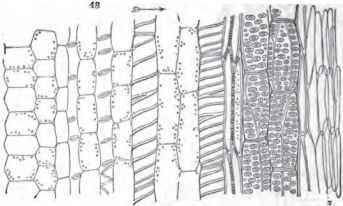 At this period the aspect of the cambium is unchanged, its formative activity continues, and new cells are deposited upon the vascular bundles. 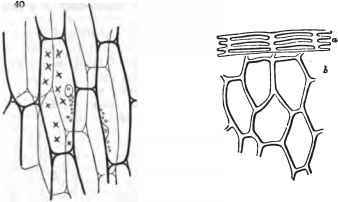 The first part of the vascular bundle is formed under exactly the same circumstances as in Monocotyledons, and exhibit precisely the same appearances (fig. 48). From this point, however, the further development is very different, for here it is important to observe that all longitudinal extension of the parts of the plant ceases. When this takes place, the new-formed cells frequently continue to extend, so that they have not sufficient room ; and the consequence is, that the ends of the cells in a horizontal layer press themselves between the ends of the cells which lie above them and below them, and thus they all become pointed. In all recently formed wood-cells it may be remarked that they are shorter than the old cells, and their ends are rounded. The peculiar form of the proscnchyma-cells is produced later. 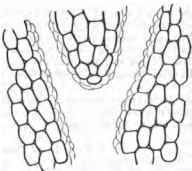 In the first part of the vascular bundles no such cells are ever found; the innermost are longitudinal parenchyma-cells, and pass gradually outwards into the wood-cells. But there arc instances where no such extension of the recently formed cells ever takes place, and then the entire wood consists only of parenchymatous cells, as, for instance, in Bombax pentandra, Carolinea minor, and perhaps all Bombacece. 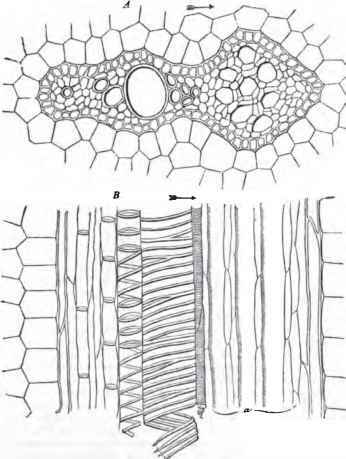 In the later products of the formative activity of the cambium, a great difference in its growth is observed, according as the cells are developed as wood-cells (prosenchyma) or as they are uniformly or irregularly deposited. The simplest kinds of wood, on the one side, are those in which all the cells are similarly developed, and where no distinction between the cells and the so-called vessels exists. Such wood is seen in the Conifera and Cycadacea, consisting of lengthened prosenchyma, like broad cells with from one to eight rows of pores (fig. 49. A> B). Successive unclosed vascular bundles from Vicia Faba; a longitudinal section. The arrow denotes the direction from the pith to the bark, a, Cambium cells. What does the transverse section of parenchyma cells show? How to draw parenchyma transverse section?